Fur Stole https://www.review-australia.com/au/fur-stole-marshmallow/RE15JK071.RECRM032.%24NA.html BACK IN STOCK. A functional, pull through stole made from silky soft faux fur, our new Fur Stole Wrap will keep you cosy and stylish. It is fully lined and features pleating details at the shoulder to give a full, flattering shape. Worn with the Santana Cap Sleeve Lace Dress. Fur Stole is rated 4.9 out of 5 by 58. Rated 5 out of 5 by Fur Stole from Soft Luxury I purchased this beautiful fur stole during a recent trip to Tasmania. I was attending a black tie event and worried I would get cold during the night. Much to my disappointment, it was a stinking hot night and I did not need the stole. I purchased the marshmallow colour and loved the contrast with my navy blue dress, although I was tempted to go blue on blue. The lady in the shop showed me how to fold the stole to use it like a scarf under a jacket, which I love. I can’t wait for winter to wear this versatile accessory. Rated 5 out of 5 by schnn from Soft, warm and stylish Upon buying this stole I wondered if it was an unnecessary purchase. It was mainly for a wedding that's theme was 1950's and I wasn't too sure if i had made the right choice. I am happy to say that not only was it comfortable and soft to war, but it also was quite warm. Very happy! Rated 5 out of 5 by traceylee from Just what we were looking for. My daughter was going to a Formal, on a cruise. She had a beautiful dress and needed something that would finish the look, keep her warm and yet not take away from the dress. The fur stole was just what we were looking for. So elegant and so beautifully made. Rated 5 out of 5 by ST85 from Absolutely beautiful! I bought this stole for my daughter to wear to a formal dance and it was perfect. Gorgeous colour, soft and luxurious and great quality. It really lifted her dress to another level. It will definitely be one of those ‘go to’ pieces for any special occasion. Rated 5 out of 5 by Sarinac from Great & elegant look I bought two lace dresses and then returned to buy a fur stole. Can’t wait to wear them! The staff were very friendly & helpful & I will be returning for another shopping event. Rated 5 out of 5 by Meg12 from Beautiful Quality! 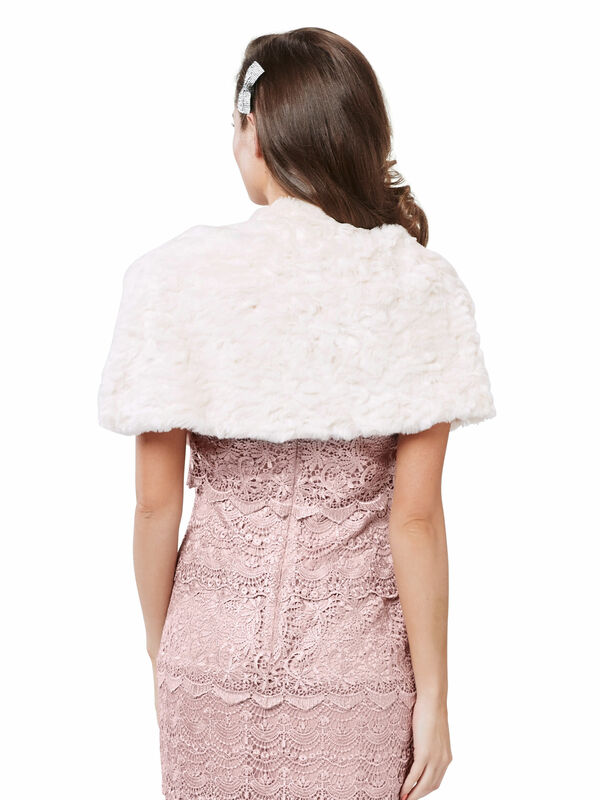 I bought this fur stole to wear to a winter wedding, and it is absolutely beautiful! The quality is amazing and it feels incredibly soft and warm! Looks amazing with almost any evening outfit. Would definitely recommend!